Discount Magic - Magic Seen Iss 80 (May 2018). 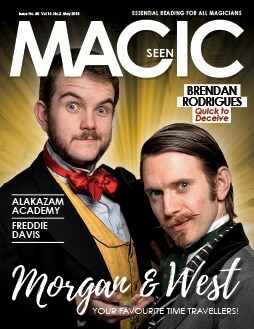 Morgan and West style themselves as the ‘Time Travelling Magicians’, but they are also huge travellers in the present day with endless hours spent on the motorway driving to their many gigs. We manage to park them long enough to have a chat and find out what’s happening with them these days. We also meet Brendan Rodrigues, who is not only a smooth, classy performer but whose dress sense makes Deputy Editor Graham Hey look scruffy! Want to learn magic from some of the best teachers around? Well, we introduce you to the wonders of the Alakazam Academy with a behind-the-scenes look at the new, vibrant venture from Peter Nardi and his team. And after you’ve learnt some new magic there, you can put into effect the advice we give in our special article on how to practise magic. One of the hardest jobs for the pro and semi-pro magician is trying to find enough bookings, and in this issue, we reveal a method that, although not a quick fix, can provide amazingly high conversion rates from enquiry to booking. Read Connections to find out more. As well as hopefully providing useful magic help in our magazine, we also seek to entertain, so you’ll hopefully get a burst of fun from the gags in One Liner Heaven, from the surprising revelations(!) in B&B Heaven, and from the latest batch of Lookalikes sent in by readers. The Masterclass features a couple of great routines, the legendary comedian Freddie Davies gets the surprise call In The Phonebox, there’s a new Pro’s and Cons discussion on whether online advertising is better than offline, plus we have news, letters and of course our big Product Review section. Magic Seen Iss 80 (May 2018) Morgan and West style themselves as the ‘Time Travelling Magicians’, but they are also huge travellers in the present day with endless hours spent on the motorway driving to their many gigs. We manage to park them long enough to have a chat and find out what’s happening with them these days. We also meet Brendan Rodrigues, who is not only a smooth, classy performer but whose dress sense makes Deputy Editor Graham Hey look scruffy!